Thanksgiving Day is a considered to be primarily celebrated in the United States and Canada as a day of giving thanks for the harvest of the preceding year. Several other countries around the world observe similar celebrations typically called Harvest orAutumn Festivals. Canada and United States at the time were British colonies and hence use the British term of Thanksgiving as opposed to Harvest. Harvest is from the Old English word hærfest, meaning “autumn”. The full moon nearest the autumnal equinox is called the Harvest Moon. So in ancient traditions Harvest Festivals were traditionally held on the Harvest Moon. Thanksgiving has roots in religious and cultural traditions however it has long been celebrated primarily secularly. The Thanksgiving holiday’s history in North America is rooted in English traditions has aspects of a harvest festival. In the English tradition, days of thanksgiving services became important in the reign of Henry VIII and in reaction to the large number of religious holidays. In 1536 reforms radically reduced the number of Church holidays and replaced by Days of Thanksgiving. There were about 30 days of Thanksgiving; unexpected disasters such as the drought in 1611, floods in 1613, and plagues in 1604 and 1622. Days of Thanksgiving were called following the victory over the Spanish Armada in 1588 and following the deliverance of Queen Anne in 1705. An unusual Day of Thanksgiving began in 1606 following the failure of the Gunpowder Plot in 1605 which developed into Guy Fawkes Day. Guy Fawkes Day is similar to the US 4th of July. The first Canadian Thanksgiving is often traced back to 1578 and the explorer Martin Frobisher. Frobisher, who had been trying to find a northern passage to the Pacific Ocean, held his Thanksgiving celebration not for harvest but in thanks for surviving the long journey from England through the perils of storms and icebergs. On his third and final voyage to the far north, Frobisher held a formal ceremony in Frobisher Bay in Baffin Island (Nunavut). The origin of Canadian Thanksgiving is sometimes traced to the French settlers who came to New France with explorer Samuel de Champlain in the early 17th century, who celebrated their successful harvests. 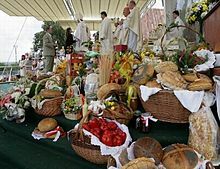 New immigrants into the country, such as the Irish, Scottish and Germans, also added their own traditions to the harvest celebrations. The U.S. aspects of Thanksgiving (such as the turkey), were incorporated when British began to flee from the United States during the American Revolution and settled in Canada. Canada celebrates Thanksgiving about 6 weeks earlier than the United States due to being further North and earlier harvest. In the United States, the modern Thanksgiving holiday tradition is traced to a 1621 celebration at Plymouth in present-day Massachusetts. The 1621 Plymouth feast and thanksgiving was prompted by a good harvest. Some argue that the earliest Thanksgiving service in what is now the United States was celebrated by the Spanish on September 8, 1565, in what is now Saint Augustine, Florida, the oldest city in the United States. In the West Indian island of Grenada, Thanksgiving Day is celebrated on October 25. Even though it bears the same name, and is celebrated at roughly the same time as the American and Canadian versions of Thanksgiving, this holiday is unrelated to either of those celebrations. Instead the holiday marks the anniversary of the U.S.-led invasion of the island in 1983, in response to the deposition and execution of Grenadian Prime Minister Maurice Bishop. Labor Thanksgiving Day is a national holiday in Japan. It takes place annually on November 23. The law establishing the holiday cites it as an occasion for commemorating labor and production and giving one another thanks. It has roots in an ancient harvest ceremony celebrating hard work. In the West African country of Liberia, which beginning in 1820 was colonized by free African Americans (most of whom had been formerly enslaved). Many of the Pilgrims who migrated to the Plymouth Plantation had resided in the city of Leiden from 1609–1620, many of whom had recorded their births, marriages and deaths at the Pieterskerk. To commemorate this, Thanksgiving Day is held each year on the morning of the American Thanksgiving Day in the Pieterskerk, Leiden, to commemorate the hospitality the Pilgrims received in Leiden on their way to the New World. In the Australian external territory of Norfolk Island, Thanksgiving is celebrated on the last Wednesday of November. The holiday was brought to the island by visiting American whaling ships. The Harvest Thanksgiving Festival in Bavaria. Started not as a Harvest Fest but as a wedding! Crown Prince Ludwig was married to Princess Therese of Saxe-Hildburghausen on October 12, 1810. 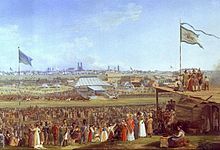 The citizens of Munich were invited to attend the festivities to celebrate the royal event. The fields were named Theresienwiese (“Theresa’s meadow”) in honor of the Crown Princess, and have kept that name ever since, although abbreviated the name simply to the “Wies’n”. Horse races marked the close of the event that was celebrated as a festival for the whole of Bavaria. The decision to repeat the horse races in the subsequent year gave rise to the tradition of the Oktoberfest. Beer was first served in 1892. But it is more than just drinking, I think. Flower festival in the Philippines, Gawai Dayak: Sarawak, Malaysia, West Kalimantan, Indonesia, Harvest festival of Zomi, Myanmar, Bagach (Багач): Belarus, Bénichon: celebrated in Switzerland is a combined harvest festival, thanksgiving, Dazhynki: Belarus, Dozhynki, Russia, Lammas celebration of first harvest/grain harvest in Paganism, Wicca by the ancient Celts, Mhellia: Isle of Man, Osenin: Russia, Pokov-Ukraine, Timoleague: Irish, Ysolo: harvest of eggplants in Albania, Spice wreath: – Cununa de spice in Romanian, Hasyl toýy: Turkmenistan, Mehregan Iran, Ancient Persia, Sukkot: Jewish harvest festival, Crop Over: Barbados, Khuado Pawi: Burma, Thai Pongal: Tamil people, Sri Lanka, and other countries. Thanksgiving. We can all be thankful for the massive amount of humanitarian deeds done by Rotary and Rotarians.